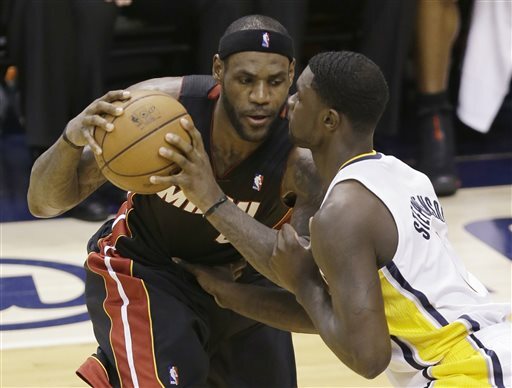 INDIANAPOLIS (AP) — Paul George scored 31 of his 37 points in the second half Wednesday night and almost single-handedly kept the Indiana Pacers alive in the Eastern Conference finals with a 93-90 victory over the Miami Heat. The Pacers still trail 3-2 in the best-of-seven series. Game 6 will be played Friday night in Miami. It took a frantic effort just to extend the series, even with the foul-plagued LeBron James held to just seven points in 23 minutes. Chris Bosh led the Heat with 20 points missed a potential go-ahead 3-pointer in the closing seconds. Indiana turned a 50-41 deficit into a 64-57 lead after three, then led by as much as 11 in the fourth. But Miami’s last-ditch rally made it 91-90 with 16 seconds to go before Indiana held on.